Finish the retro look with the correct style headlights of the 1970 with a twist in performance and added function. A unique touch on the LED Colorshift halos to keep at a distance with other me-2 cheap aftermarket halo projector eBay headlights. These Dodge Challenger Quad HID Bi-Xenon Retrofit are the way to go for the performance oriented. These headlights are not friendly to work with, we had to cut the permaseal little by little and they had to go in the oven at least 5 times for each headlamp. Then it’s time to strip the glue from the front lens and back of the housings to make way for the new precision glue we add at the end of the build to seal the headlights to avoid any moisture or seal problems on the long run. 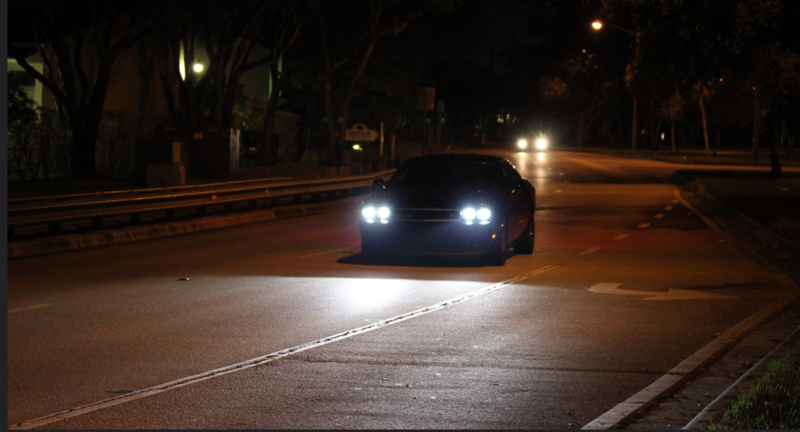 The main point of the dodge challenger retrofit and getting all this work done and why it’s well worth it is because we managed to install four FX-R Bi-xenon projectors to run the quad challenger projector headlights like nothing else you have seen before. Four low beams at same level that can fire up as high beam with the push of a lever. LED headlights are starting to finally become available and you will see them as options for the projectors you can choose in your custom headlights. The hids offer more performance while the led is easier to run and maintain. It’s up to you on what option you go with but you can always ask us and we will be happy to recommend you what we have tested as top in performance.